When dog owners discover your profile via search and select Quick View they’ll see several statistics that provide at-a-glance info about your response rate, response time, and photo rate. Improving these statistics can put your clients’ minds at ease and encourage them to contact you. Response rate measures how often you respond to requests within 24 hours. This number is based on your 10 most recent requests. For example, a 100% response rate means that you’ve responded within 24 hours to each of your last 10 requests. Always responding within 24 hours will keep your response rate high, but you’re more than twice as likely to book the stay if you respond to requests within an hour of receiving them. Note: As a sitter, you may occasionally get duplicate requests from the same dog owner. Be sure to respond to all requests--duplicate requests contribute to your response rate too. Response time measures how quickly, on average, you respond to new requests. This number is based on your 10 most recent requests. Responding within 15 minutes of receiving requests is a great way to improve this stat. If you haven’t already, enable text message notifications to reply faster than ever. 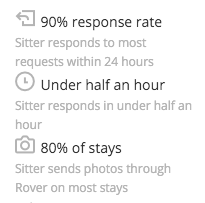 Photo rate measures how often you send photos through Rover of your client’s dogs during stays or walks. This number is based on your 10 most recent stays or walks in which the dog owner has requested both the booking and photos. Sending photos is a good way to assure dog owners that their dog is in great hands. You can even send photos after a booking has ended to improve your rate at any time.